Tell Me Everything is a platform for interaction, a split confessional (this view placed on separate floors of PAI) allows guests to interact either as penitent or confessor. A one-way live audio feed allows confessors to listen to the penitents secrets. While this scenario might offer the consolation of anonymity there is also the opportunity for paranoia or at least awkwardness. Who heard your confession? 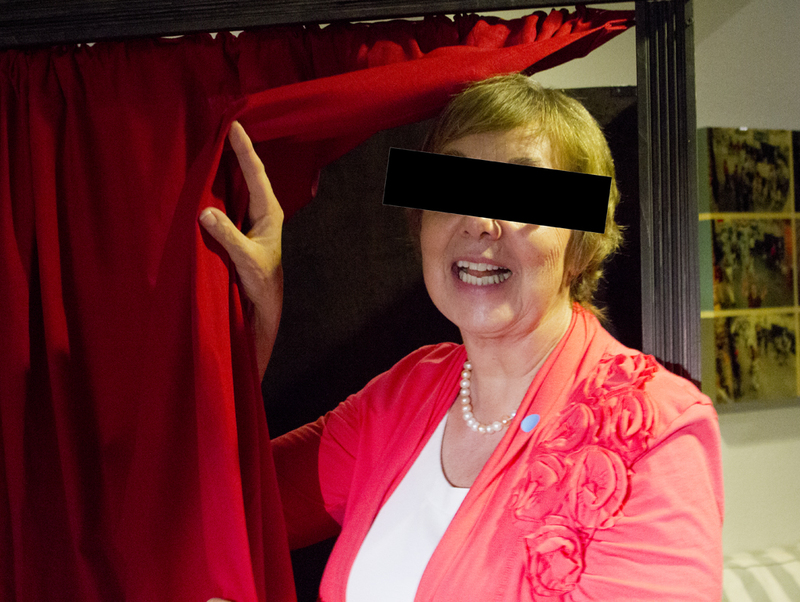 Whose secrets are you now privy to? Tell Me Everything is a sort of social “getting to know you” game that sets in motion scenarios that both mock and celebrate contemporary notions of intimacy and the act of contrition. All images from installation at the Performance Art Institute of San Francisco as part of the show Micromanagement curated by Sean Fletcher & Isabel Reichert. 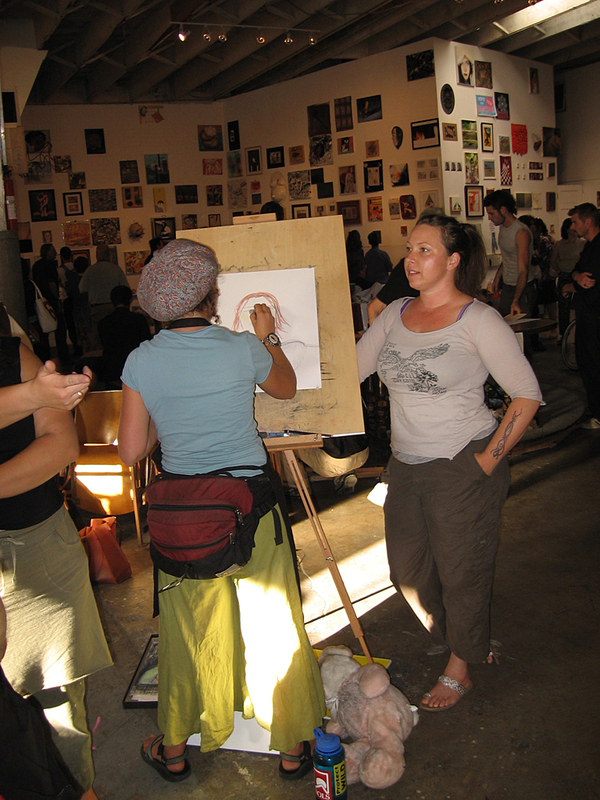 The Portrait Project is an ongoing social interaction (since 2005) where the “client” becomes the “artist”. Seemingly set up as a caricature busker’s stand, passersby are solicited not to have their portraits drawn, but instead to create a portrait of the artist. I purchase all the portraits for the same amount regardless of the time spent or the quality of the results, they become mine to exhibit and use –generating questions of ownership and originality, trade, compensation and fairness. Am I, as a trained artist encouraging creativity in others or merely exploiting the naive? This piece further expands and continues my search for the locus of art. Is art originated in the act of creating a situation, in the resultant work or in some other shifting loci? Colony refers to colonizing through theft and gift simultaneously, gestures and approaches are conciously appropriated and offered up to viewer/participants freely. 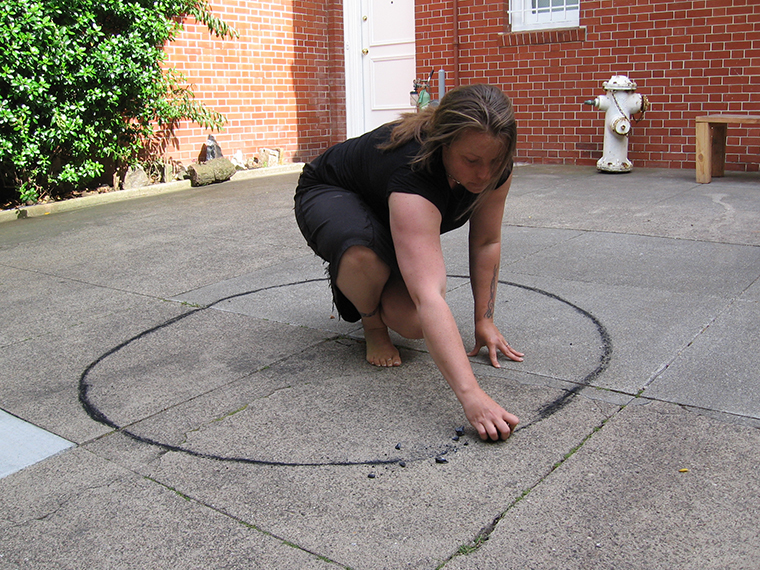 Three key actions make up every iteration of the piece; drawing a circle describing the limit of my reach, filling the circle with soil from my garden (equivalent to my mass or weight), inviting participants to take and transplant that soil elsewhere.